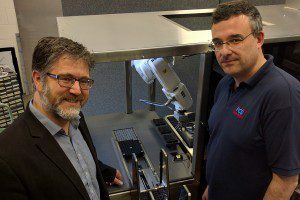 Innomech and FCS Automation (FCS) have agreed to work together to offer medical device manufacturing companies a more integrated approach to robotics and automation. The new partnership will help companies looking to improve the efficiency, reliability, capacity or other key aspects of their production lines, to comply with new regulations or to integrate new functions. Automation consultancy Innomech and FCS, a specialist in PLC control systems plan to pool their complementary skills for targeted new business opportunities and to build on the success of a large-scale project that they recently completed for one of the world’s largest medical equipment manufacturers. The image shows Tim Mead, MD at Innomech with Mathew Sumpton, director at FCS. The two companies worked together to help a global corporation transfer an existing multi-stage automated system from one of its US sites into a UK production facility, while at the same time updating and reconfiguring it to significantly improve its efficiency.